SAVE THE DATE: April 2nd – Hip-Hop 4 Flint Newark! Newark Riverfront Revival is proud to partner with Hip-Hop 4 Flint for the Newark event being held on Saturday, April 2, 2016 from 2-5pm at Robert Treat Hotel located at 50 Park Place in Downtown Newark. The event is being held in partnership with the City of Newark Health & Community Wellness Department, Newark Water Department, Ironbound Community Corporation, Essex County College Urban Issues Institute, Housing and Community Development Network of New Jersey, GrassROOTS Community Foundation, 211 Community Impact and the Newark Office of Film + Television with the goal of raising awareness about lead poisoning and environmental pressures in the City of Newark and to raise funds to contribute to the national goal of $80k. The event is open to all ages and features performances by Urban Kween, Gallery Retail, DJ Express, Young Bonez, Negros Americanos, NeNe Ali, DJ Scotty Nevers, Sol Zalez, Miss Nana, Rhymaggedon, Rahzel the Beatboxer, Doitall of the Legendary Lords of the Underground and more! Tickets are $10 and all proceeds go towards the national fundraising goal which will be used to purchase high-quality water filters for 250 homes in Flint, MI. This entry was posted in Uncategorized on March 11, 2016 by riverfrontcoordinator. Newark Riverfront Revival is proud to partner with Newark Celebration 350 for our 5th Annual Walk to the Water and River Day taking place on Saturday, May 21st from 11am-6pm! Join us on the steps of Newark City Hall on May 21st at 11am and walk to Newark Riverfront Park in symbolic reclamation of our riverfront! Enjoy a day full of fun family friendly activities celebrating the history, culture and revitalization of Newark’s Riverfront. 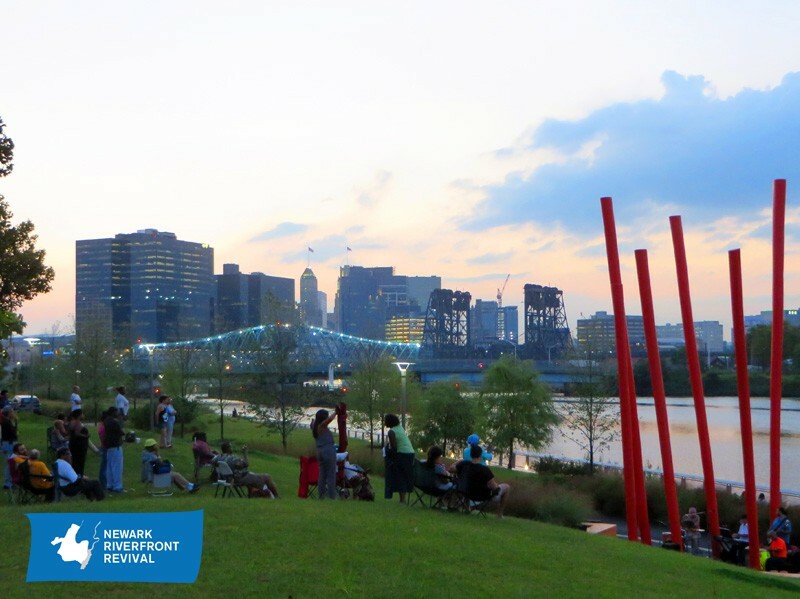 Newark Riverfront Park Awarded the EPA’s Smart Growth Award for 2015! Newark Riverfront Revival is proud to announce that we were one of three national winners of the EPA’s National Award for Smart Growth Achievement for 2015! Congrats to all the residents, organizations, institutions, designers, patrons and contributors who have helped to to make Newark Riverfront Park a beautiful public space for all residents of the city. Riverfront Park fulfills a decades-long movement to reclaim the Passaic riverfront for the people of Newark, New Jersey. Situated on the site of a former metal smelting plant, the park is becoming an integral part of the community’s identity and activity, hosting events and festivals and giving thousands of people a place to walk, bike, relax, and play. An inclusive design process guided decision-making throughout development. The park is expected to attract economic development, particularly to downtown Newark. EPA created the National Award for Smart Growth Achievement in 2002 to recognize exceptional approaches to development that protect the environment, encourage economic vitality, and enhance quality of life. In the past 13 years, 62 winners from 26 states have shown a variety of approaches that states, regions, cities, suburbs, and rural communities can use to create economically strong, environmentally responsible development. EPA’s Office of Sustainable Communities manages the awards program. Newark Riverfront Revival was proud to partner with Newark based Cobblestone Multimedia in the creation of our first ever Youth Apprenticeship Program this past Summer 2015. In partnership with the Newark Works Youth Program, NRR/Cobblestone Multimedia employed 12 city youth, who spent 5 weeks at Newark Riverfront Park learning about the ecology of the Passaic River, Park Stewardship, Arts and Culture Programming, and Multimedia Skills. Apprentices spent time working with partner organizations such as the Newark Office of Film + Television, the city’s Government Access channel NWK TV, and Panasonic to get greater insight and experience on the types of multimedia arts careers they can build in the city of Newark. The project culminated in a video created by our apprentices in which they applied the multimedia skills that they learned to highlight Newark Riverfront Park programming and issues around the environment of Riverfront Park. Congratulations to our apprentices for all of their hard work and enthusiasm. Check out the results of their work and feel free to share on social media in celebration of Newark youth! This entry was posted in Uncategorized on March 10, 2016 by riverfrontcoordinator. Celebrate Newark’s 350th birthday and tell your ‪#‎Newark‬ story with Neighborhood History Day, this Saturday, March 12th from 11am-6pm at East Side High School, hosted by Ironbound Community Corporation in partnership with Newark Celebration 350! Enjoy this ingenious graphic created under the auspices of City of Newark’s planning office, and taken from the Newark Riverfront Guide. Newark Riverfront Guides are available through Newark Riverfront Revival for donations of $3. Contact newarkriverfront@gmail.com to purchase your copy! NEWARK — The U.S. Environmental Protection Agency announced Friday its $1.4 billion plan to clean up the most polluted portion of the Passaic River, an area made so unhealthy from corporate dumping that people are forbidden from eating the carcinogenic fish and crabs that come from it. Friday’s announcement of the project, which may generate over 500 jobs and which officials said will not be paid for by taxpayers, was tempered by criticism from the Sierra Club, and righteous anger from former U.S. Senator Cory Booker over what corporations did to the river and Newark in the first place. Also, EPA officials cautioned, this project to clean up the lower eight miles of the river, will take over 11 years, and even then the fish won’t immediately be safe to consume.